George Graham Reviews Keb' Mo's "Suitcase"
The blues comes in many forms, from the original authentic solo Delta blues performers to big ensembles with horns to what is essentially a kind of musical revue. But perhaps the best-known variety is the hard-driving electric blues that came out of Chicago, and was adopted by so many rock musicians from both sides of the Atlantic in the 1960s. And one seemingly essential ingredient of the blues is lyrics about suffering in one way or another, since the music was originally a way to cope with misfortune. If there is such as thing as happy blues, then the man for that is Keb' Mo' on his new CD called Suitcase. The popular Grammy and W.C. Handy Award winner is out with a new recording that almost brims with optimism and has few occasions for a broken heart, with song titles like Life Is Beautiful, Still There for Me, and I See Love. As is typical for Keb' Mo', there's a lot of fine musicianship and classy songwriting, while still keeping something of an attachment to more the traditional acoustic blues sound. Kevin Moore grew up in Compton, California, near Los Angeles, and was exposed to blues, Gospel, and 50s and 60s R&B growing up. His parents were both from the Deep South. His uncle gave him a guitar when young Kevin was still a child, and he expanded into trumpet and French horn. While playing in local cover bands in the early 1970s, he was recruited by the late blues violinist Papa John Creach, known for his work with the Jefferson Starship and Hot Tuna. Moore took a job with a publishing company, writing songs and working on demos, and eventually released his first album in 1980. The future Keb' Mo's first real venture into seriously performing the blues came though his theatrical background. When he was cast in the role of a Delta bluesman in a stage production, he immersed himself in the music to prepare for the part. By the early 1990s, he started to attract more attention for his acoustic blues, and took on the name Keb' Mo' when that was what a friend got to calling him when he played the blues. He was signed to a major label and in 1994 released the eponymous CD Keb' Mo', and soon began attracting attention with his acoustic-based music in a style most associated with electric music. He achieved perhaps unexpected popularity for a performer with his blues credentials, but his recordings have never been purely blues, blending with pop and even jazz, which certainly helped to widen his appeal. He has also won three Grammy Awards in the Contemporary Blues category. He has also continued his acting career including portraying Robert Johnson in a film. Suitcase is Keb' Mo's eighth album and it reunited him with producer John Porter who handled his first few releases. The band is a somewhat variable one comprising a number of Los Angeles-based studio musicians, plus New Orleanian John Cleary on keyboards, as well as jazz players like percussionist Paulinho deCosta. Keb' Mo' plays mainly acoustic guitars, including the steel resonator guitars favored by traditional bluesmen, as well as a little banjo. The songs are all new originals, ranging from introspective to whimsical in mood, and from quasi-Delta blues to big soul arrangements with a horn section and backing singers. There's even a hint of country, with some steel guitar played by Greg Leisz on a couple of tunes. But the musicianship is all first rate, as is Keb' Mo's vocal performance. 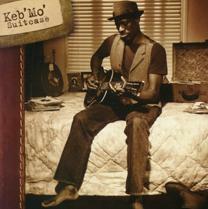 Keb' Mo's past albums have been a fairly broad stylistic mix, though with the blues at its core. Suitcase is a bit more blues-like musically than some of his past recordings, but the often sunny and downright celebratory lyrics are miles from the heartbreak and trouble that one usually expects from the blues. Hearing about other people's troubles is one reason the blues can make you feel good. But this CD can make you feel good as well, with lyrics that are often uplifting, along with some excellent musicianship throughout. It's classy stuff, for the most part, though sometimes perhaps a bit sweeter than my taste in blues. Our grade for sound quality is about a C-plus mainly because of the ubiquitous bugaboo of too much volume compression. Even the supposedly soft songs hit maximum physical CD volume on almost every beat, and the heavy compression applied to Keb' Mo's vocal causes some noticeable distortion, not to mention destroying the dynamics of his performance. It has been a while since we reviewed a major label release, and this is a reminder of just how far the competitive race to the bottom has gone for maximum loudness at all times. The mix also has a rather spatially flat, two-dimensional quality. Keb' Mo' is one of those performers who has taken the blues beyond its traditional audience, with his wide-ranging, appealing music. Suitcase continues in that stream, and though not his best album, is one that provides appealing listening for broad audiences and perhaps may open the ears of additional pop music fans to the more mainstream forms of the blues.